Tensions were high on the Missouri House floor in Jefferson City last week, when members voted 81-56 against a $4 million summer jobs program. The vote came after discussion about a January KMOV-TV news report, which quoted current and former employees at the St. Louis Agency on Training and Employment (SLATE) as saying SLATE is mismanaged. 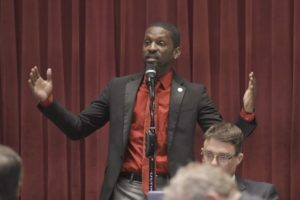 Missouri House Urban Issues Committee Chairman Bruce Franks, D-St. Louis, the only Democrat to chair a House committee, blasted KMOV’s report on the House floor on Thursday. “Well let me tell you about the 388 kids, young people, that now have bank accounts,” Franks says. Franks says the 388 young people in St. Louis City now understand financial literacy and financial empowerment, because of the summer jobs program involving SLATE. He says some of them work with St. Louis Police and Fire. “And when a gentleman from Greene (another state representative) brought that story up, you (Speaker Haahr) knew what that story was about,” says Franks. “And when we had the opportunity Mr. Speaker to do the right thing, you pressed that red button (voting no at his desk). That’s not having my back, Mr. Speaker,” says Franks. As for Speaker Haahr, he says he’s disappointed in Representative Franks’ floor comments. “I’m disappointed he never once came to me and I’m also disappointed that he questioned my motives on the (House) floor,” Haahr says. 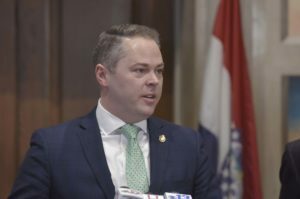 Missourinet asked both Speaker Haahr and Representative Franks about what happened on the floor, during separate Thursday press conferences. Speaker Haahr says he called Franks after KMOV’s story aired to make sure he was okay, adding that they never discussed the budget at the time. “As far as I know, Representative Franks and I have always had a good relationship. I gave him the chairmanship of the (House) Urban Issues Committee. I’ve sent bills to his committee,” says Haahr. Haahr says if Franks had come to him, Haahr would have told him that he had spoken to House Budget Committee Chairman Cody Smith, R-Carthage, and that the $4 million request is more than the summer jobs program has utilized during the past two years. Franks and House Minority Leader Crystal Quade, D-Springfield, tell Missourinet they’re optimistic the Senate will fund the $4 million summer jobs program. Leader Quade notes GOP Governor Mike Parson has recommended funding for the program. “The governor has seen the value in this (summer jobs) program, and with our restoration of the funds in previous years, he understood how important it is for workforce development, which is something that we’re talking about time and time again in this body. And he requested that full funding,” Quade says. Franks says Hannibal Regional Health Care, Habitat for Humanity in St. Charles County and Tammy’s Tiny Tots (a daycare facility) in Potosi are just some of the Missouri businesses that participate in the summer jobs programs. Franks, who’s in his third year in the House, says the summer jobs program had bipartisan support from the entire House two years in a row. He notes the program impacts all 114 Missouri counties and every legislative district. The Missouri House voted Thursday to approve a $29.2 billion state operating budget. It includes a $100 million transportation infrastructure plan and an $8 million retention pay plan aimed at investing in wage increases in Missouri Department of Corrections (DOC) staff. The budget now heads to the Missouri Senate. The state Constitution requires lawmakers to approve a balanced budget by early May.